It’s no secret that I’m a big Star Wars fan. In 1997, on their 20th anniversary release, my cousin took me to the theaters and that was the beginning of my fandom. I wrote a little bit about Star Wars recently by reposting the original Tumblr post (and if you go back a bit, I wrote reviews on a few of the other great Star Wars “Legends” books as well – Thrawn Series, Darth Bane). Today, I want to write a bit about the new canon. Disney acquired Lucasfilm in 2012, and in 2014 announced that previous Expanded Universe stories would fall into the Legends banner and not be included in the official canon. From there, with their new official storyboard team, Star Wars created a whole new canon. First off, I think this was a great idea. Yes, we may miss out on the amazing Thrawn series, fan favorite Mara Jade, and the future of Luke and Mara’s children. We may even miss out on the Knights of the Old Republic era, or the great Darth Bane series explanation of the Rule of Two. But, we finally get a cohesive storyline (hopefully), no more retcons, and a chance to see the story expand under the leadership of Disney. If the Marvel Cinematic Universe is any indication, then I’m very excited for what’s to come. Exploring the new canon so far (as of Oct, 2016), there’s a lot of material to digest. Between the movies, cartoons, books, and comics there’s something for every fan. There’s actually a great interactive wiki on all this, but I want to simplify and scratch the surface into each of the stories. I’ll use the movies as the timeline markers, and give my personal opinion of each. [TV Series] The Clone Wars: This cartoon series is amazing. I felt the first couple seasons were a little slow, but it gets really good. You can binge watch the whole thing on Netflix. It’s long (6.5 seasons – some “lost” episodes you have to watch on starwars.com), but I say it’s a must-watch. [Comic] Darth Maul – Son of Dathomir: If you liked the cartoon series, then this is a great way to figure out what happened to Darth Maul (note: they never finished the cartoon series so they expanded that material onto other mediums). There’s also a potential connection down the timeline in the Journey to the Force Awakens Shattered Empire comic. If you’ve watched the cartoon, then it’s a must-read. Otherwise, you could probably pass. [Book] Dark Disciple: Like Darth Maul, this is a fallout from the cartoon series. You’ll learn more about Quinlan Vos, and see what happens to Ventress. It’ll might be a little hard to follow if you haven’t watched the series, but if you do, then this is a must read. One of my favorite Star Wars books, Christie Golden does a fantastic job. [Book] Lords of the Sith: This story is entirely about how ridiculously powerful Darth Vader and Emperor Palpatine are. It’s action packed and entertaining, but (IMHO) not necessarily critical to the core storyline. Fun read, but not critical. [Book] Tarkin: This book takes an in-depth look at our favorite Grand Moff Tarkin. We get a glimpse of him in the Clone Wars series of his beginnings, but this fills it out completely – how he grew up and how he came to be the Grand Moff. It was good, so if you’re fan of his character then it’d recommend it, but I wouldn’t consider it a must-read. [Comic] Kanan – The Last Padawan: If you like the Rebels Series, then I think this does a great job in settling the stage of Kanan’s beginnings and character. You get a good appreciation of what happens after Order 66. I’m a big fan so far. [Book] A New Dawn: This book tries to set the stage for the Rebels series. It’s mostly a story of how Hera and Kanan meet. It does a good job, but unless you’re a huge fan of the Rebels series, I don’t think it’s necessary crucial to the storyline. It’s a nice-to-read. [TV Series] Rebels: This is fantastic cartoon. The team has done a good job creating new characters (Ezra and crew), as well as mixing in nostalgia from the previous Clone Wars series (e.g. Ahsoka Tano, and Darth Vader cameos). This show tries to setup the beginnings of the rebellion in Episode IV. I’m excited to see what comes next. [Book] Lost Stars: This is my favorite book of the Journey to the Force Awakens series (I don’t mind if it’s a “young adult” novel). It tells a Romeo and Juliet inspired story of two kids who grew up together, and eventually land on either side of the war (Empire vs Rebellion). It takes a different cross-sectional look at Episodes IV through VI, and concludes in Jakku. Must read. [Comic] Princess Leia: After Episode IV, Princess Leia goes on a mission to save Alderaan survivors. So far, it’s my least favorite of all the new Star Wars comics book series to far. [Book] Smuggler’s Run – A Han Solo & Chewbacca Adventure: Another young adult novel, that more or less is what is advertised in the title – A Han Solo & Chewbacca adventure. I felt that this one was also pretty forgettable without many hints of Episode VII. I’d take a pass on this one. [Book] Heir to the Jedi: Set soon after Episode IV, this explores Luke and his struggle/thoughts to understand the Force. Overall, of all the new Canon novels, this was my least favorite and mostly forgettable. I think this book is a pass. [Book] The Weapon of the Jedi – A Luke Skywalker Adventure: I thought this one was great, and in some instances does a better job of showing Luke’s struggles of becoming a Jedi than Heir to the Jedi. There’s some great references to the Clone Wars series, some nods to Episode VII, and potentially some hints of Luke’s Jedi ambitions. If my hunch is right, I think it gives of a hint of Luke for Episode VII. It’s short, and enjoyable. [Comic] new Star Wars: With this, Disney/Marvel re-launched the new Star Wars comics, taking over from the Dark Horse days. 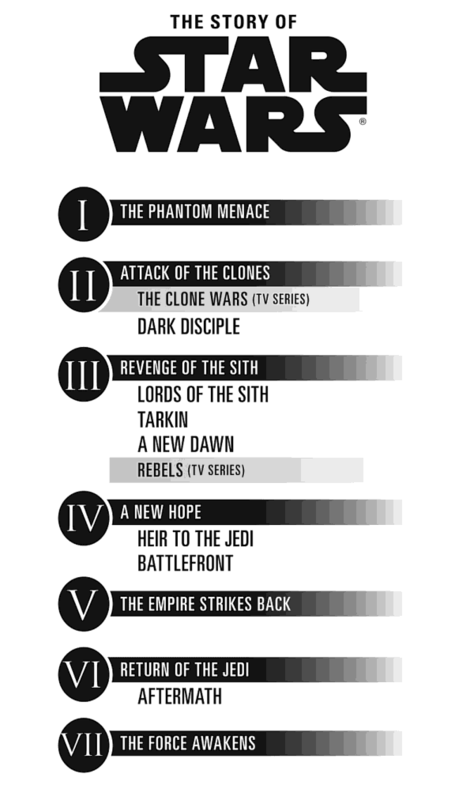 The series skips around the timeline quite a bit, but it’s mostly set between Episode IV and V. Some of the story arcs are pretty good (Skywalker strikes) and others are less interesting (Han Solo’s wife!?!). I would say it’s a should-read given the importance to the canon as a whole. [Comic] Darth Vader: My favorite series of the new Star Wars comics. Tells the story from Vader’s perspective and leads to his understanding of who Luke is, as well as planting the seeds to what eventually happens in Episode V and VI. I’m a huge fan. [Comic] Lando: My 2nd favorite of the new comics. Doesn’t really add to the storyline much, but gives you a glimpse of why Lando’s character is so interesting…and a look into the Jedi/Sith artifacts that Emperor Palpatine holds (there’s a small connection to the Shattered Empire comics). Super fun, but not necessarily a must-read. [Book] Moving Target – A Princess Leia Adventure: Of the 3 young adult adventures, this might be my favorite. This is the only story that’s set between Episode V and VI so far, so there’s less hints about Episode VII but more about how they learned of the 2nd Death Star. Similar to the other adventures, it’s short and enjoyable. But by no means a must-read. [Comic] Shattered Empire: This series is set days after Endor. Gives us a glimpse of Poe Dameron’s (from Episode VII) parents, and a look into Leia and Luke. (IMHO) It’s not particularly exciting, but seems important for a storyline perspective. Must-read only because of the storyline implications. [Book] Aftermath: The beginning of a trilogy that sets the stage of Episode VII. It gives some small hints of what various key characters are doing (e.g. Han Solo and Chewbacca), and some insights into the beginnings of the Knights of Ren, but it’s mostly about how the Empire gathers itself after Endor and the fall of the Emperor. For me, I thought the story was a slow start…it didn’t pick up until halfway through the book. It was an okay story, but given the importance to Episode VII, it’s a should-read. So far, that’s what I have. As more material comes out, I’ll try to update my list. Needless to say, I’m excited for the Force Awakens. And, apparently, it’s no different from the rest of my generation. I’m just bummed that that I now represent the “past”…let’s see if the Force is as strong with the future as well.